Theme is responsive and is optimized for any screen size. It will look awesome on iPad, iPhone, Android or any Windows Phone. Razor sharp text, vibrant colors, awesome graphics and sharp images on HiDPI (Retina) displays. This theme features built in theme options for additional customization. This means that you can work with logo, social links, webclip icon, favicon, webmaster tools and other awesome features. Featured slider will make your most important content to stand out. It has several built in transition effects as well as various other options. We have an outstanding support team and we will support you free of charge. Some additional services and website development services are also available. Feel free to leave message on ourSupport Forum. Theme has multiple layouts to choose from. You can choose default layout as well as specify layout for each post. We support all free and premium plugins built for WordPress. We did extra optimization for most popular plugins such as Breadcrumb NavXT, WP-PageNavi, Contact Form 7, and WordPress SEO Plugin. 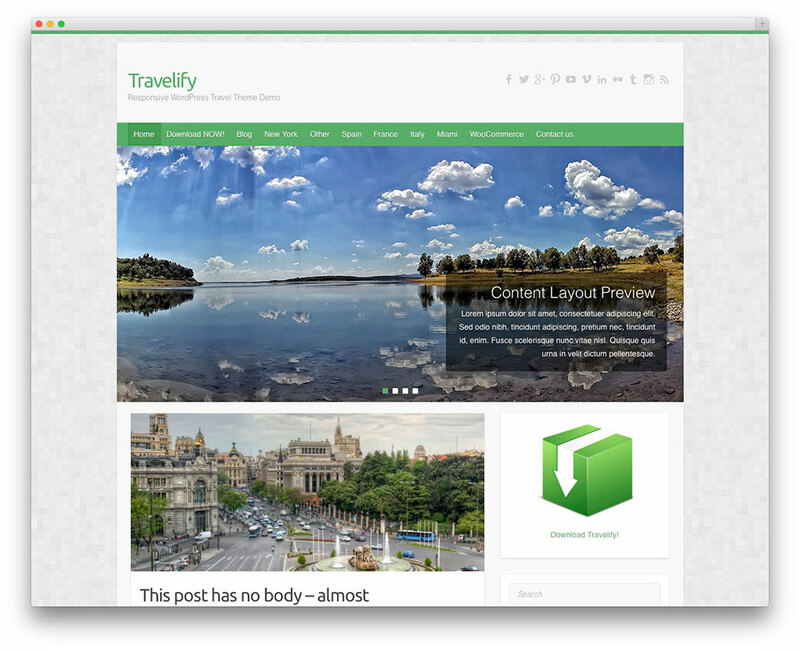 Download Travelify theme to see it yourself. We have covered the most important function on the detailed Theme instructions page which you can find here. Theme is translation and multilingual (WPML plugin compatible) ready including support for Right-to-left languages. Travelify is available in 18 different languages. More information on how to translate WordPress themes.